Off to the big city we went. To see the ENT. 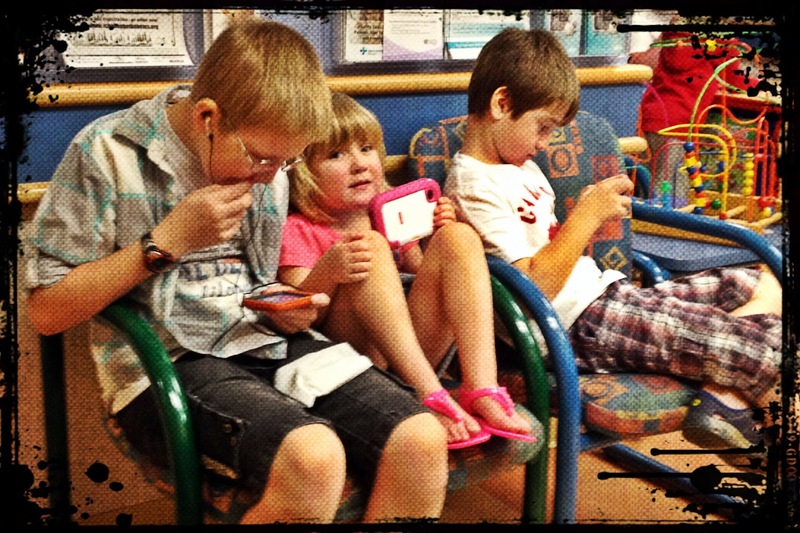 Here are the kids waiting in the waiting room. Usually what happens when we go to see the ENT is that after driving for five hours and getting a hotel room for the night, they see her, then they don't want to do anything because she's not serious enough to bother doing anything. When she was younger and we tube fed her, we had lots of testing done. A couple years ago, after I insisted, we had an ABR (auditory brainstem response) done. Three months ago, we did an oximetry sleep test, which measured her oxygen levels while she slept and they were normal, so they didn't need to see us again. So, I was actually surprised when we got the call to come done again. Amazing what three little words... Smith-Magenis Syndrome... can do. We got quite a few things done. And then? We got to see a sleep specialist!!! Here, where we live, sleep specialists are impossible to get into. Years long waiting lists. And despite our asking, until our SMS diagnosis, a sleep specialist was out of our reach. Until yesterday. When our ENT paged our new sleep specialist who answered within the hour and said, sure, I can fit them in at 1:30 pm. So, we had three hours to kill, but heck. We were going to see a sleep specialist! So, at 1:40, she introduced herself and apologized for making us wait until 1:40 to see her. All I could do was thank her profusely for making time for us. A three hour wait? We figured on at least 6 months. We talked about the rarity of SMS. About restless leg syndrome and that it can be common in SMS'ers. And treatment for that. And melatonin. And acebutolol. And GI issues. And a few other things I'm sure that I can't remember now. And then I told her I loved her. And I do, my friends, I do. If you can love a person after a 1 hour consultation? Then I love her. Because it has to be filled in the big city and then FedEx'ed up here. They can't make it here. Not in a suspension or that size of dose. Which we didn't know until we got home today. But the point is? We're getting real help. And maybe we might see an improvement in her sleep. AND behaviour. And we have a doctor who thinks big picture. At the whole body. Which, in my books, is a good thing. Early anecdotal reports of therapeutic benefit from melatonin taken at bedtime remain encouraging, providing variable improvement of sleep without reports of major adverse reactions. Dosages should be kept low (≤3 mg). However, melatonin dispensed over the counter is not regulated by the FDA; thus, dosages may not be exact. No early and controlled melatonin treatment trials have been conducted. A monitored trial of four to six weeks on melatonin may be worth considering in affected individuals with sleep disturbance. A single uncontrolled study of nine individuals with SMS treated with oral ß-1-adrenergic antagonists (acebutolol 10 mg/kg) reported suppression of daytime melatonin peaks and subjectively improved behavior [De Leersnyder et al 2001]. This treatment, however, did not restore nocturnal plasma concentration of melatonin. A second uncontrolled trial by the same group [De Leersnyder et al 2003] combined the daytime dose of acebutolol with an evening oral dose of melatonin (6 mg at 8pm) and found that nocturnal plasma concentration of melatonin was restored and nighttime sleep improved with disappearance of nocturnal awakenings. Parents also reported subjective improvement in daytime behaviors with increased concentration. Contraindications to the use of ß-1-adrenergic antagonists include asthma, pulmonary problems, some cardiovascular disease, and diabetes mellitus. Both my paediatrician and sleep specialist knew about the studies in France and acebutolol and understood that it's being used in kids with SMS with mixed results. The cardiologist? Thought we were a little crazy when we mentioned it, but that just shows what he knows. So, we're going to give it a shot. First of all, kids in a waiting room. Classic photo! I'm so happy for you. You are doing a real service for many people by posting this info. As for loving a doctor...well it is rare but when you finally find one who truly gets it and truly cares, it is love.